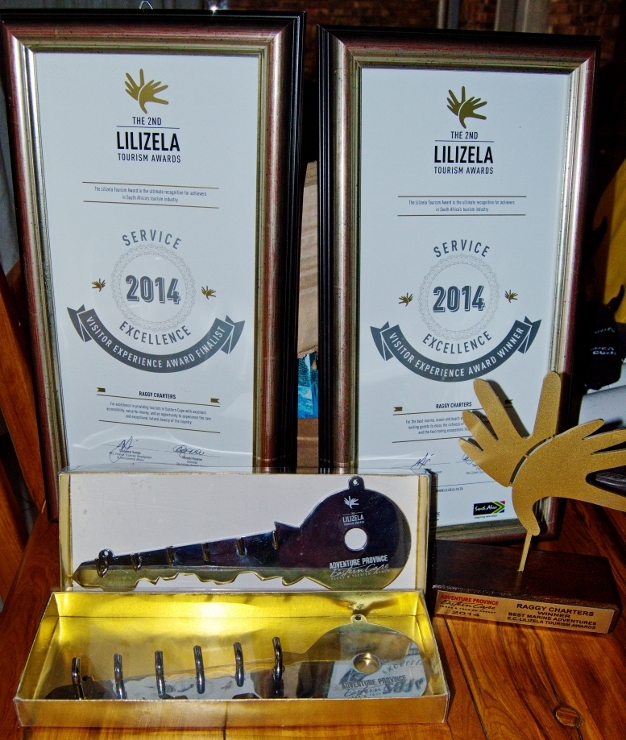 On Tuesday 9th September Port Elizabeth hosted the Eastern Cape Lilizela Tourism Awards. It is only the second year that these awards are taking place but they aim to recognise and reward tourism players and businesses who work passionately and with pride to deliver a world class product and service and whose delivery grows South Africa’s global destination competitiveness. So you can imagine our overwhelming surprise and happiness to be announced as the winner of the Visitor Experience of the Year in Marine Adventures, for the Eastern Cape. Raggy Charters won in Best Marine Adventures, for the best marine, ocean and beach experience in the Eastern Cape, inviting guests to enjoy the richness of the country’s coastline and the fascinating ecosystems that it supports. This award is the ultimate recognition for achievers in South Africa’s tourism industry and we owe our win to all the guests we’ve had over the years who voted for us! We also owe our thanks to Algoa Bay, for providing such incredible wildlife encounters that have made our visitors so extraordinarily happy. Many have said our cruises are a bucket list experience for them so we can only hope the animals and the ocean keep thriving and maintain the rich biodiversity we have here. The national Lilizela winners from each category will be selected from the pool of all nine provincial winners and announced at the inaugural national award ceremony taking place on the 9th of October 2014 in Tshwane, and we are just thrilled to be invited to such an event.